This page covers Y-chromosome DNA (Y-DNA; following direct/"pure" paternal lines from the father – the patriline) and mitochondrial DNA (mtDNA; following direct/"pure" maternal lines from the mother – the matriline) on my family tree and indicates their descendants where this information may help others research their genetic genealogy. It also outlines where others may be able to help me – and where I am willing to cover the costs of having the testing conducted. 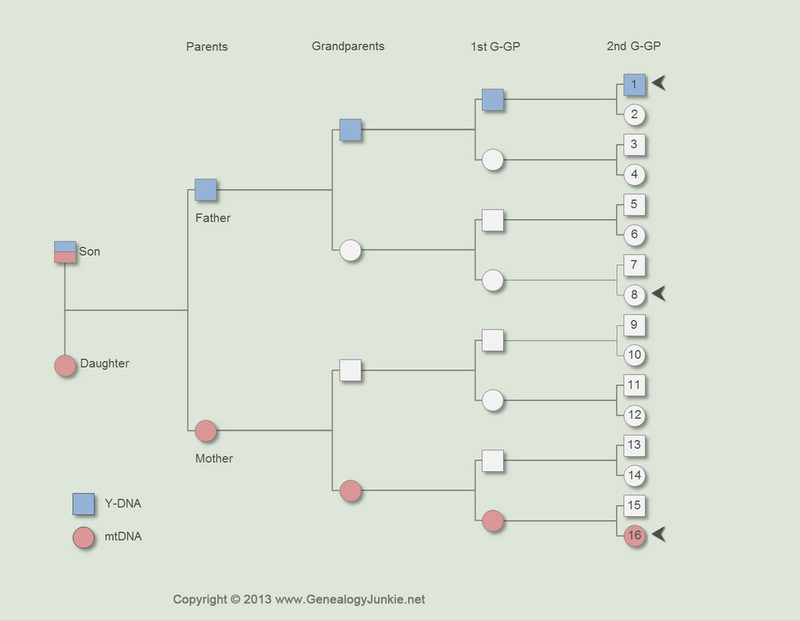 See Genetic Genealogy for some background information and Do You Have the Right DNA? On the maternal line (mtDNA) from Elizabeth Grieve (1858-1939), Mary Ann Coulthard (1828-1908 – #16 on the Figure below), Elizabeth Hetherington (1786-1849) or Sarah Dixon (1755-1849) from Wetheral / Cumwhinton / Castle Sowerby in Cumberland, Liverpool, Lancashire, and Birkenhead, Cheshire – see Beer-Grieve-Coulthard-Hetherington-Dixon mtDNA for which haplotype we have. I'd love to hear from anyone who may be willing to provide a cheek swab or saliva sample (it depends which testing facility is used) for Y-DNA and mtDNA to expand Lines #4, #5, #11, #12. See Do You Have the Right DNA?, which I'm willing to cover the costs for. You will retain "ownership" and control of your DNA and will have full access to the results. IMAGE DETAILS (DNA Double Helix): This work has been released into the public domain by its author, Apers0n at the English Wikipedia project. This applies worldwide. This image is in the public domain because it contains materials that originally came from the National Institutes of Health.